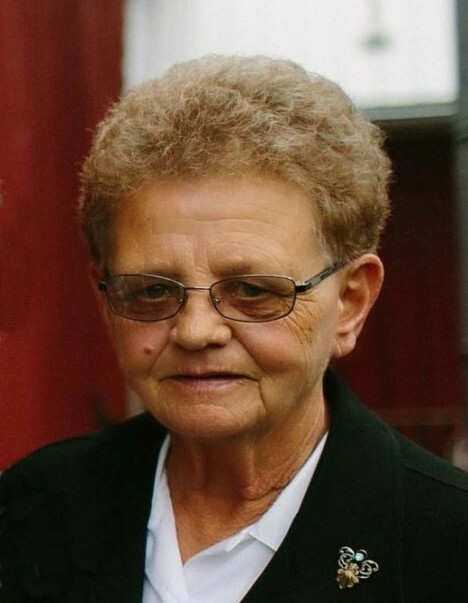 Darlene Borg of Watson died on Tuesday, December 4, 2018 at the Swift County Benson Hospital at the age of 74 surrounded by many of her family. Her astonishing work ethic and steadfast kindness will not be forgotten. Darlene Yvonne (Molden) Borg was born on March 31, 1944 in the Benson Hospital, Benson, MN to Harris and Harriet (Johnson) Molden. She was baptized and confirmed at the Big Bend Lutheran Church in Big Bend. She grew up with her brother and sisters on the family farm in rural Milan. She attended and graduated from Milan High School. On June 23, 1962, she was united in marriage to Jerry Borg. They made their home in Montevideo until 1973 when they moved to Watson. Affectionately known as Dar by her family and many friends, she was a nursing assistant by trade, a marvelous cook and skilled seamstress. This woman perfected the art of DIY long before the advent of Pinterest. Rarely unable to sit and relax for more than forty-five minutes, she was continually tinkering with a project; some of which included reupholstering furniture, quilting (although she’d rather be painting the house), baking hundreds of donuts (literally, she made hundreds of donuts for her granddaughter’s wedding), refinishing furniture, painting kitchen cabinets, and making Special K bars and potato salad for every special family event. Ever the trendsetter, Darlene was ahead of her time with "being green," as evidenced by the "I Can't Believe It's Not Butter" containers and bread bags neatly tucked in her kitchen drawers to be used for any bit of leftovers. Her self-sufficiency lead to an acute talent for telling it like it is, but her compassion for others was always evident. Her family and friends will dearly remember her generosity and remarkable resourcefulness. During her forty-five minute increments of free-time, she loved gambling, watching afternoon soap operas, playing cards, a good meal, having other people cook for her later in her life, taking afternoon naps, a good pie and renting movies. She also loved playing Pinochle, which included arguing with Bruce about the scorekeeping, dancing to old time music and of course, drinking coffee in her kitchen and on the deck. The coffee pot was always on. When she wasn’t occupied with a project at home, Darlene was tirelessly working at Luther Haven where she cared for hundreds of residents over the past 33 years, including her mother and mother-in-law. She would say she was lucky to have been able to work side by side with her granddaughter, Tarah and all of her Molden nieces (who also called her Grandma Darlene.) Much to the dismay of Jerry and family, she did not enter retirement until just this past November. Darlene fiercely loved her children, grandchildren and great-grandchildren and was sincerely dedicated to her family; as evidenced by her 56-year marriage. She will be sorely missed and is survived by her husband, Jerry of Watson; children, Brad (Karen) Borg of Ortonville; Wendy (Tim) Lindemann of Montevideo; Stacy of Watson; grandchildren, Tarah Lee; Leah (Nik) Lines, both of rural Montevideo; Samantha (Daniel Simeone) Lindemann of Chicago, IL; Tanner Lindemann of Dickinson, ND; great grandchildren, Brayden, Lillyanne, Sawyer, Camden, Tucker, Angele; sisters, Phyllis (Stanley) Baldwin and Barb (Larry) Christenson; sisters-in-law, Lynn Molden; Audrey (Curtis) Tjosaas, all of Montevideo; LaVonne (Darrol) Olsen of Granite Falls; Marilyn Dahl of Burnsville; many nieces and nephews and extended family. Darlene was preceded in death by her parents; brother, Bruce Molden; mother-in-law and father-in-law, Julius and Myrtle Borg; brother-in-law, Derrold Dahl and sister-in-law, Delores Rhode. All whom loved her dearly will never forget her tenacity, dry sense of humor, kindness, and everlasting love for them.